The benefits of having a cattle guard on your property drastically outweighed the one-time burden of installation, but how do you choose what design would be best for your operation? It commonly boils down to choosing between the style of the top pipe: round or flat. The most aggressive of the typical steel cattle guards are made with round top pipe and provide a substantial physical livestock barrier to your flat-hoofed cattle. Its curved surface provides the least stable footing possible so your cattle can’t find a balanced or sturdy place to put their weight. The hoof will rock forward or backward and give the most uncomfortable footing possible that’s almost impossible to balance on. Even if one of your animals does attempt to try a step on a top rail, the experience of the unsettling instability will make them turn the other way and they won’t bother to test it again. The inability to find stable footing on a round-pipe is the most effective physical deterrent besides a gate and is made possible with a cattle guard. 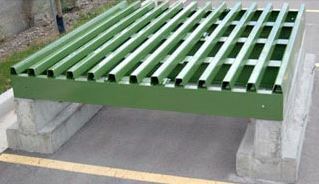 Both round and flat pipe cattle guards provide a visual deterrent in addition to their physical barrier. They are traditionally mounted on concrete footings like a bridge which creates an open vaulted area underneath. The drop under the top rails provides a visual cue of depth that in itself, can prevent cattle from attempting to cross. There have been studies done with visual illusions painted on flat asphalt that resulted in cattle turning away even though the surface was perfectly flat. Researchers painted the illusion of pipes and a corresponding shadow to create the illusion of depth. When the cattle were exposed to the artwork, they assumed it was an unstable and elevated and did not attempt to cross. This optical trick worked for a limited amount of time but eventually did break down after a few days as one of the cattle (the bravest apparently) did place a hoof on it and eventually crossed. The others soon followed and the illusion barrier on it’s own, was defeated. Barn World offers round pipe cattle guards that have the option of being permanently boxed, an option for laying directly on the ground, or with a removable box for cleaning underneath. A steel skirt welded all the way around the exterior to allow it to be placed directly on the ground without a foundation forms a permanent box round the guard. It does not bear any weight and is only there to prevent dirt from creeping underneath. The design is so it may be simply laid on the ground with a dirt ramp up on either side for vehicle crossings. It’s very popular for low traffic areas and for use in construction sites as wash-outs and rumble strips. It can be used to clean construction equipment before going out on a public roadway. This box style allows for the ‘Texas Gate’ to be lifted out of place to clean out any debris that was built up over time without disturbing the surrounding area. This feature is nice for a complete cleaning if you have the equipment to lift the guard. The round pipe design is available in an economic private-use or the HS20, 16 ton per axle, public highway rating used in roadway projects. The flat pipe provides the benefit of allowing high-speed traffic to cross more smoothly than a round pipe design. It is also effective as a livestock barrier but the pipe is technically flat on top with a large space between each rail. This design is not quite as aggressive at deterring hoofed animals as there is a small flat area but is less rough on crossing vehicles. 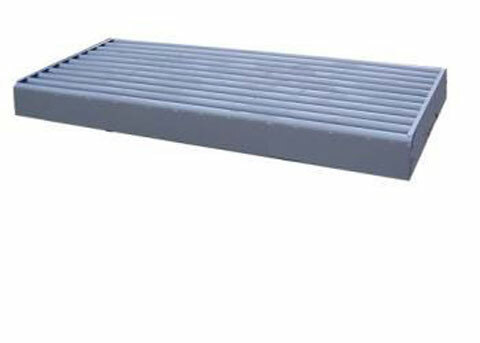 These cattle grids are also available to ship with precast concrete cattle guard foundations that can be lowered directly into the ground without the need for pouring concrete on site. The foundations come with mounting bolts already poured to match up with the cattle grid and can be installed directly in the field. The precast foundations are especially handy in remote areas where concrete is not available. Providing convenience for vehicles crossing fence lines while securing your large animals is accomplished with the simple, tried and tested traditional cattle guard. You don’t always need to open a close a gate! For more information or for help with planning your cattle guard project, contact barn world.com at Sales@BarnWorld.com or (720) 238-2190 today and click the following link to check out our Livestock Youtube Channel!